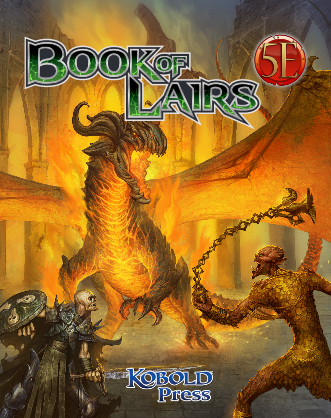 Designed by some of the top names in the RPG industry, Book of Lairs is sure to add an aura of wonder and mystery to your game! 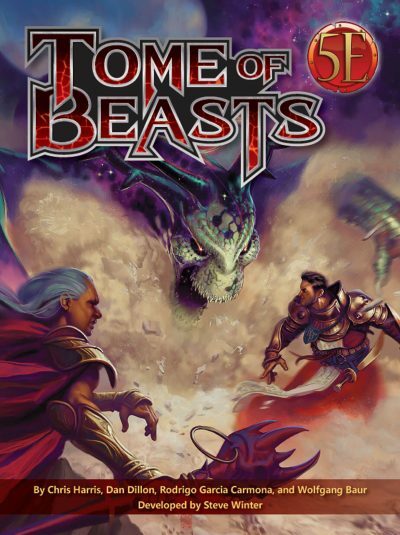 Book of Lairs uses standard monsters as well as surprising new creatures from Tome of Beasts, and both monster books are required for maximum playability. Also Available: To expand your battlefield, pick up high‑resolution battle maps with two PDF files for every lair (a DM’s version of each map is included with notes in the regular edition). 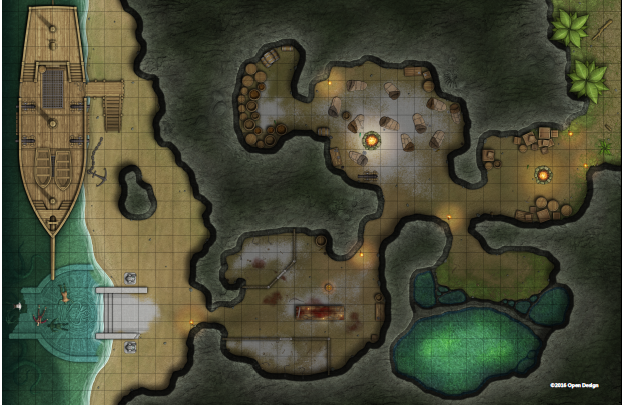 Each digital battle map comes with and without a grid, so you can use it with a projector or with a virtual tabletop (VTT) such as Roll20, d20Pro, or Fantasy Grounds! Add the Book of Lairs Map Pack to your order for expanded maps! This massive book clocks in at 109 pages, 1 page front cover, 1 page editorial, 1 page ToC, 3 pages of advertisements, 1 page of SRD, leaving us with a total of 102 pages of content, so let’s take a look! All right, before we do…what is this? In short, it could be considered to be a massive companion tome to the even more massive Tome of Beasts, but that would be only the tip of the ice-berg. Basically, this massive book contains a significant array of set-piece locations you can easily drop into your game, with the opposition making partially use of the monsters from the Tome of Beasts. 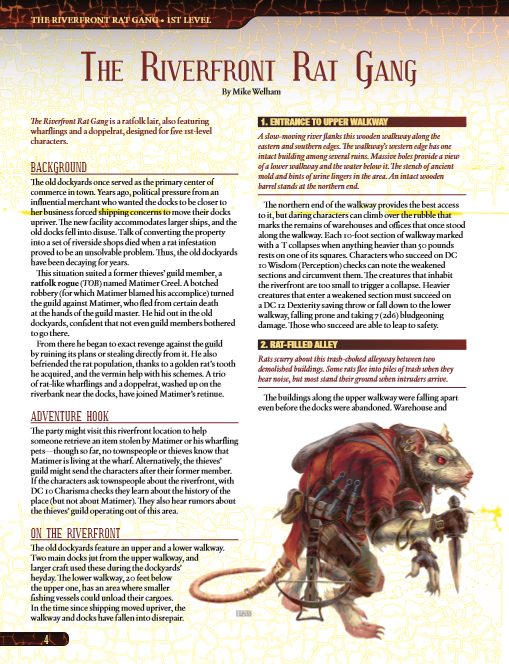 While the book does not contain the statblocks of the opposition, it does provide rules for e.g. traps and obstacles, if featured in the respective environment. 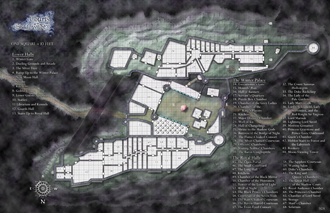 The respective lairs come with gorgeous full-color maps that feature the keys; every keyed location points towards an area, including a sequence of read-aloud text. The respective lairs are intended for level 1, 3, 4, 5, 6, 7, 8, 9, 10, 14 and 15 – though several lairs e.g. are provided for 3rd level. All right, this is about as far as I can go without going into SPOILERS. So yeah, potential players should jump to the conclusion, even though I will try hard to not go into the nit and grit of the respective storylines told by the environments. Mike Welham goes first and provides a nasty old dockyard, where ratfolk have set up shop alongside some nasty wharflings and doppelrats; a suitable sidetrek challenge for 1st level PCs. 3rd level PCs may explore the lost halls of everforge, penned by Shawn Merwin – a dwarven hall now abandoned, where they may be just in time to prevent the ascension of a flame drake to its more powerful, probably too strong, iteration! Also at this level, Mike Shea’s “Den of the Rotten King”, where a dread wererat king lords over the denizens of the underworld, which may be nice, but it pales before Mike Welham’s trip to the Clockwork Tower – with the complex devices and interaction with the environment makes this one of the strongest offerings herein regarding its mechanics. At 4th level, Shawn Merwin provides a lindwurm lair in the titanic ranches of no other place than Yggdrasil! Oh, and add in some ravenfolk for added complication and you have a great lair. Also at 4th level, Steve Winter invites us to visit the Castle of Sand, situated next to a gorgeous oasis…and yes, not all is here as it seems…but I’m not going to dispel that particular mirage here in the review. Brain England’s Pirate’s Cove for 5th level characters brings us to an almost archetypical pirate hide-out…that houses darkest horrors and a blasphemous cult instead! Mike Welham’s All-seeing eye deals with a cult that has been on the wane…and features some disturbing motifs regarding eyes and the like – it does not have to turn sour…but then again, what would you do if you saw a disturbing cluster of eyes floating towards you? Yeah, thought so. 6th level PCs can look forward to a trip to Shawn Merwin’s alchemists’ guildhall – which may, map-wise, be one of the most conservative lairs herein, but it does feature an interesting component regarding the opposition that astute PCs may well notice….and the true villains here are perhaps not what the PCs expected. The Hive, penned by Mike Welham oncegain, would deal with the complex beholden to the feared spawn of Arbeyach and thus can be pictured best as a complex with a nasty termite/insect-theme. Brian England takes us to the almost classic Temple of the Deep Ones at 7th level, where the PCs face off versus coral drakes, deep ones and similar critters. Not my favorite one, though the map provided for this one is truly gorgeous and colorful. James J. Haeck’s Monument of the Thunderer, set in and on a gigantic dragon statue, certainly is one of the most amazing maps in concept herein and the lair, as such is high-concept and rewarding, though the opposition faced…well, isn’t. The foes featured per default here are a bit bland. The same can definitely not be said about the 8th level “House of Reeds and Whispers”, a wonderful, dark and horrific little set-piece that almost feels like it was penned by Richard Pett, and not Jon Sawatsky. Yes, this is intended as a compliment, Mr. Sawatsky, for the atmosphere here is neat indeed. If you are looking for a no-frills sword & sorcery-vibe, I’d certainly recommend Shawn Merwin’s Tomb of the Scorpion King. Marc Radle’s dark forest has a direct tie-in with the umbral tower lair and represents basically a druidic area with a threat of shadow-themes eclipsing it; the location is per se solid, if less than what I expected from the evocative cartography. Shawn Merwin and Wolfgang Baur then proceed to take us to exactly said tower, which not only spotlights my beloved shadow-fey, it also offer advice for adapting it to temperate forests and features even a brief chase and some nice environmental options – another highlight herein. Marc Radle’s Warlock crypt (9th level) redeems him – once again, we get the evocative themes we have come to enjoy from his writing, with the King in Silver and similar fexts making for unique foes, even though the map isin’t as amazing as that of some other complexes. Enrique Betran’s Aboleth Grotto is a classic take on the trope and makes for a fun environment to explore, making good use of TOB’s new critters…but it falls behind Robert Aducci’s Bloowood of the Cruor Circle – which makes perhaps the coolest map I have seen for the dark druid theme…pretty much ever. Oh, and the adversaries also are neat. Shawn Merwin’s Imperial Ghoul Outpost is per se nice, though I have an issue with the new material, which deals “1 point of necrotic damage” on a hit – is that +1 or does it convert 1 point to necrotic damage? Not sure there. Steve Winters brings us back to the sand-choked tropes of sword & sorcery with the fane of serpents…including rival adventurers. As an aside, I combined that one with Legendary Games’ shrine of serpents in my own game…worked rather neatly! Wolfgang Baur does show where his reputation comes from with the “Sky Stairs of Beldestan” – not only is this 14th level lair’s cartography gorgeous to behold, the environment depicted is absolutely fantastic – and with traveler and pilgrims as well as death lurking at the top, this location just oozes pure style. Speaking of which: The kobold-commander-in-chief also presents the citadel of the void dragon, situated at the very edge of space; lack of air and the unique layout are just some of the obstacles to contend with here and yes, this lair is just as fantastic as the stairs. The final lair herein would be from the pen of none other than Jeff Grubb and pit the 15th level PCs against an umbral vampire. Yes, it features a soul organ and the complex is shaped like a star of David, adding some occult notions to the lair and ending the book on a high note. Editing and formatting are very good on both a rules-language and formal level. 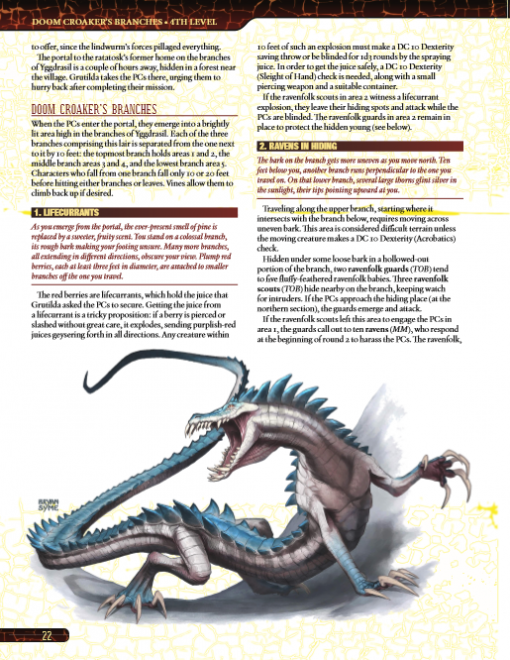 Layout adheres to a gorgeous two-column full-color standard and the pdf sports numerous, gorgeous full-color artworks, though fans of kobold press may be familiar with some of them. The pdf comes fully bookmarked for your convenience. 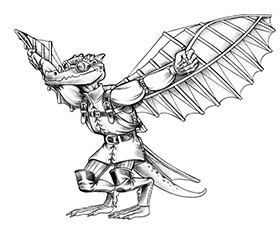 Cartography is at once amazing and the biggest drawback of the book: If you do want to get player-friendly versions of the maps, you’ll have to purchase them separately on the Kobold Press-store. I kinda get why, considering their quality, but it is still something that would gall me…particularly if got the print and it didn’t have them. I do not have the print version of this book, so unfortunately, I have absolutely no idea if it features the player-friendly iterations of the maps or not. The designers Robert Aducci, Wolfgang baur, Enrique bertran, Brian Engard, Jeff Grubb, James J. Haeck, Shawn Merwin, Marc Radle, Jon Sawatsky, Mike Shea, Mike Welham and Steve Winter have done a per se great job in this book – there is not a single bad lair herein; all of the locations are evocative, fun and feature something that would qualify them as worth being used. In the quality of the writing, there is not much to complain about. However, this also means that you really *NEED* Tome of Beasts to make the most use out of the lairs presented herein…unless you’re as versed as yours truly is and know what a “fext” or an “alseid” is, what powerlevel you’d use there, etc. So nope, I would not consider this book as such a good supplement for other systems….the maps, though…heck yes! When used as intended for 5e with the Tome of Beasts, the consequence of the lack of stats herein is that the book demands a lot of page-flipping, as you have to look up the respective critters in the ToB, which represents a comfort detriment I considered somewhat annoying; similarly, I get why official D&D-supplements can’t be quoted by page. Why this can’t be done for the book this is a companion to, though, baffles me. I found myself searching quite a bit in the ToB-pdf while using this. As a whole, I really, really loved most aspects of this massive books; the writing is excellent, the maps for the most part stellar…but the book does feel a bit inconsiderate, with its externalized player-maps, with its book-flipping sans page-numbers for stats that should imho be inside these pages. If you’re willing to put up with these admittedly minor hassles when using this, you’ll get a superb collection of material, but personally…I never quite managed to shake off that little sense of annoyance. So yeah – quality-wise, most definitely a true gem and, if that was all to judge, this would get my highest accolades. But having no player-friendly maps included is a huge deal for me and, combined with the slightly “more-difficult-than-need-be”-handling of the book, I can’t go higher than 4 stars as my official verdict.